The iPod touch has a 5-megapixel iSight photo camera and HD (1080p) 30 frame-per-second video camera on the back. The lens is on the back so that you can see the picture you are about to take on the display. The back camera offers 5x digital zoom and the ability to tap the picture to adjust the exposure for lighting conditions. The iPod touch also has a 1.2-megapixel front camera that can take photos and record HD (720p) videos at up to 30 frames per second as well as show FaceTime video calls. 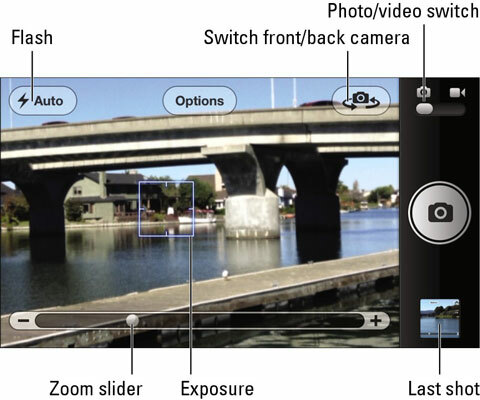 You can use the Camera app to shoot photos and video clips with either back or front camera. You can record video clips that are suitable for sharing on Facebook, Twitter, or YouTube; you can copy them to your computer for further editing or edit them with Apple’s iMovie app. To take a picture, choose Camera from the Home screen. If this is the first time you are using Camera or if you’ve turned Location Services off, the Camera app asks if you want to turn Location Services on (if it is not already on), and if you want Camera to use your current location. You don’t have to let Camera use Location Services to take pictures. But if you do turn it on and give Camera permission by tapping OK, Camera can then tag photos and videos with location information. After awakening but before unlocking your iPod touch, you can quickly take a picture with the iPod touch camera by sliding the camera icon up to reveal the Camera app. After you choose Camera, the view through the lens appears in the iPod touch display. You can switch between photo and video by sliding the switch in the corner of the screen. 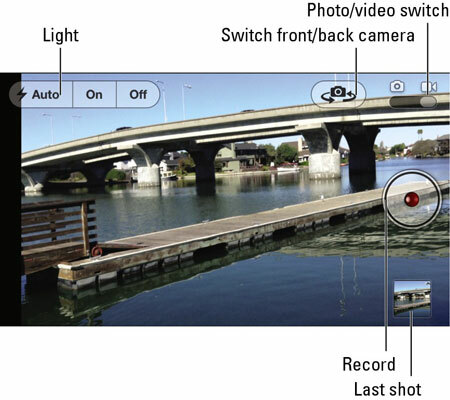 The switch cameras icon (circular arrow) lets you switch from the back camera to the front camera. When using the back camera, which is higher in resolution, you can pinch the picture to show the 5x digital zoom slider. You can zoom in or out by dragging the slider (this is a digital zoom, which magnifies pixels, not an optical zoom, produces a higher-quality result). If you tap the picture before taking the picture, a light blue exposure rectangle appears briefly near the center of the view through the lens. This rectangle shows the area where the Camera app is sensing the lighting conditions for adjusting the exposure and focus. Change the area by tapping the photo once in the spot in the picture where you want to focus. The Camera app automatically adjusts the exposure and focus of the shot based on the lighting conditions for that area of the photo. Tap and hold (a long tap) until the exposure rectangle pulses in order to lock the exposure and focus. Tapping the picture also displays the Options button at the top of the screen (camera mode only). Tap Options, and then tap the on/off switch for the Grid option in the Options pop-up menu to turn Grid to On, which shows a grid for positioning the image in the frame of the shot so that you get the best quality. You can also turn high dynamic range (HDR) for photos on or off. HDR increases the dynamic range by combining three separate exposures into a single shot. HDR works best with photos of stationary objects. Tap Options, and then tap the on/off switch for the HDR option in the Options pop-up menu to turn HDR to On or Off. If you turn HDR on, you may also want to keep a normal version of the photo in addition to the HDR version — choose Settings→Photos & Camera from the Home screen, and tap the on/off switch for the Keep Normal Photo option to turn it to On or Off. You can tap or hold and lift your finger on the shutter button to take the photo. Holding the shutter button can help to reduce shanking. You can also press the volume button on the side of the iPod touch. An image of a shutter closing appears on the display to indicate a photo was taken. The iPod touch makes a shutter sound unless you set the Ringer and Alerts volume all the way down by choosing Settings→Sounds. The photo is stored in the Camera Roll of the Photos app. A thumbnail of your last shot appears in the corner of the Camera screen. Tap this thumbnail to see your last shot. Panoramas are unbroken views of an entire area. You can snap a panoramic photo with your iPod touch. You get better results taking the panoramic shot with your iPod touch in horizontal orientation. Tap Options, and then tap Panorama to enter Panorama mode. An arrow and horizontal lines appear on the screen with the message Move iPod continuously when taking a Panorama. Focus on one end of the panoramic area, and tap the shutter. The shutter turns into a Done button. Move your iPod touch in a continuous motion in a single direction — as you move the iPod touch, the arrow moves across the screen. For best results, keep the arrow on the center line as you move the iPod touch. To shoot video, hold the iPod touch vertically (for portrait mode) or horizontally (for landscape mode), and tap or slide the photo/video switch to set it to video. The shutter button turns into a red record button. Tap the record button to start recording — it blinks while recording. Tap the blinking record button again to stop recording.